Protests Erupt in Sabarimala Over Presence of Woman Temple opened once again on Monday for puja to mark birth anniversary of last king of princely state of Travancore. Tension prevailed at Kerala's Sabarimala temple on Tuesday morning as devotees protested the presence of a woman at Valiya Nadapanthal. The Lord Ayyappa temple opened once again on Monday for the 'Sree Chitira Atta Thirunal' puja to mark the birth anniversary of the last king of the princely state of Travancore, Chithira Thirunal Balarama Varma. The devotees rushed towards the woman on the intuition that she belonged to the "barred" age group. They refused entry for her till her age was confirmed to be over 50 years. The police escorted her to a hospital and said she was 52 years old. In the meantime, protesters attacked journalists covering the agitation. A cameraman working for a Malayalam news channel was assaulted by the protesters as he was covering the agitation from a roof. The police rescued the cameraman after protesters threw chairs at him. The cameraman of another Malayalam channel likewise sustained injuries after being assaulted. 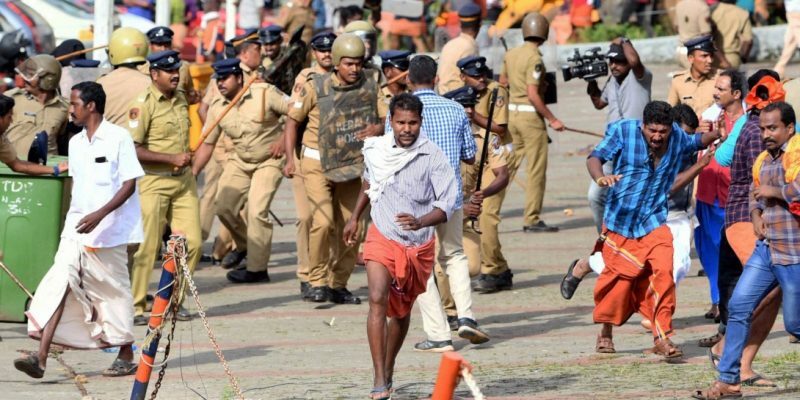 On Monday night, a 30-year-old woman who had reached Pamba base camp with her husband and two children flee after protesters remained defiant on excepting her entry to the Sabarimala shrine. The doors of the place of worship were opened Monday for the second time in three weeks amid unexampled security over the fear of protests by those opposing the Supreme Court order permitting women of all age groups into the temple.